William Frend De Morgan was arguably the most important ceramic designer of his era and a central character in the Arts & Crafts Movement. He was a life long friend of William Morris and close associate of Edward Burne-Jones, but his style was unique. A vase, dish or tile decorated by William De Morgan is immediately recognisable by its original motifs and technical quality. William De Morgan was born into an intellectual family with an enthusiasm for new ideas. His father, Augustus De Morgan (1806-1871), held the first chair of mathematics at University College, London and introduced the abstract approach to algebra. His mother Sophia Frend (1809-1892), was a pioneering spiritualist as well as being a campaigner for womens rights and prison reform. William de Morgan inherited his strong urge to innovate from his parents. Evident not only in his imaginative artistic designs, but also in his wide range of technical improvements in pottery. He developed new methods of decoration, re-introduced and refined production processes and designed kilns as well as equipment. In 1859 William De Morgan began studies at the Royal Academy, but was not destined to become a painter or sculptor. 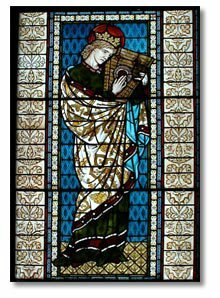 In 1863, he started experimenting with techniques to create stained glass and decorated tiles. Contrary to what is commonly assumed, De Morgan never became a partner in William Morris’s Firm, but Morris did market De Morgan’s products and used them in his decorative schemes. During 1872, he established his own firm, which produced decorative tiles and ornamental pots. De Morgan did not throw or paint pots himself, but he was responsible for their decoration: Animals and birds were his favourite subjects during this period and they appeared on his wares boldly outlined and in bright colours. The popular Stork and Frog design dates from this period. Also in the early 1870s William De Morgan revived the lustreware technique. This type of ceramic was popular in the Middle East until the thirteenth century and in Spain until the fifteenth century. In Italy, where it was known as ‘maiolica’, its popularity peaked in the sixteenth century. What made lustreware special was a fine metal film deposited over its surface, which renders the colours iridescent: this shimmering shift in colour depends on the angle at which light hits the decorated object. Because making lustreware involves complicated firing conditions in the kiln, it is quite hazardous. 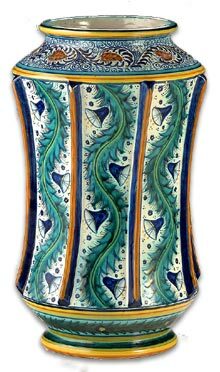 However, this did not deter William De Morgan, who not only re-introduced this technique into nineteenth century pottery, but refined it. Deep, rich tones of blue, red, yellow, violet and green. This type of decoration was inspired by the brilliantly coloured sixteenth century pottery of Iznik, in Turkey. De Morgan’s designs used the same freely drawn floral and abstract motifs, but were of his own invention. He continued using Turkish-inspired decoration throughout his career. In 1882, demand for his ceramics increased and De Morgan moved his business to larger premises; close to William Morris’s at Merton Abbey. The production of ornamental vases, bowls and dishes increased significantly and owed much to Morris’s influence, De Morgan’s beasts and floral patterns became more intricate and refined. In 1887 and well into middle-age, William de Morgan married the artist Evelyn Pickering (1855-1919), almost sixteen years his junior. It was a harmonious marriage and in addition to their artistic pursuits, they shared a well-documented sense of humour and an idealistic spirit. Their mutual interests included social reform, spiritualism and music. Evelyn provided financial and moral support for her husband’s pottery business, which was successful but still required investment capital. In 1888 the business was moved, for the last time, to Sands End (Fulham), where De Morgan began a ten-year partnership with the architect Halsey Ricardo. It was here that De Morgan created much of his finest work. Though his earlier decorative pottery, including the humorous or mock-heraldic animals and persian designs, remained popular he now developed a more mature and beautifully atmospheric style. Among the masterpieces of this period are the triple-lustred dishes (using copper, silver and gold) from a set that De Morgan called his ‘Sunset and Moonlight Suite’. Around the same time De Morgan became involved with the Arts and Crafts Exhibition Society. Like William Morris, De Morgan firmly advocated fine hand craftsmanship. 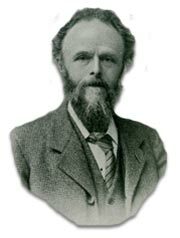 He served on the committee for the 1888, 1889 and 1890 exhibitions and over the years contributed regularly to the Arts & Crafts Society’s exhibitions from 1888 until 1906. From the early 1890s, due to health problems De Morgan and Evelyn decided to spend the winters in Florence and as fellow artists they led an idyllic life in Italy. Evelyn created many of her best pictures, while De Morgan worked on his designs with the Italian painters he had hired. The De Morgans spent weekends in the hills above Florence, at the sumptuous villa of Evelyn’s uncle, the Pre-Raphaelite artist John Roddam Spencer Stanhope (1829-1908). Unfortunately, because of his absence, De Morgan’s English pottery business suffered. His partner, Ricardo, who had his own practice, could not spend enough time overseeing work at the De Morgan factory and their partnership ended in 1898,. William De Morgan then embarked on a new partnership with three of his employees, but the days of his pottery were numbered. Distance, lack of business acumen and changes in stylistic taste all contributed to its demise. Finally, in 1907, after years of financial struggle, William De Morgan’s firm went into voluntary liquidation. Once he stopped designing he needed another outlet for his ingenuity and he chose writing and re-invented himself as a novelist. His first novel, Joseph Vance (1906), became an unexpected international success. It was followed by other bestsellers like Alice-For-Short (1907), Somehow Good (1908) and It Never Can Happen Again (1909). Like much of his design work, his novels are filled with De Morgan’s playful sense of humour. None of his books remain in print today, but they can still be found in libraries and specialized shops. In 1917 William De Morgan died, probably of influenza. 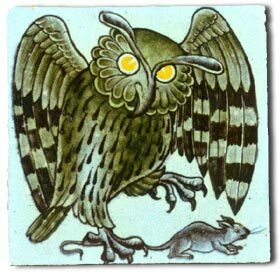 Today William de Morgan is almost forgotten as a writer, but well remembered for his magnificent and unique ceramic decoration. His glowing lustreware is highly sought after by collectors like Andrew Lloyd Webber and it is exhibited at the Victoria & Albert Museum, the De Morgan Centre and other exhibitions.